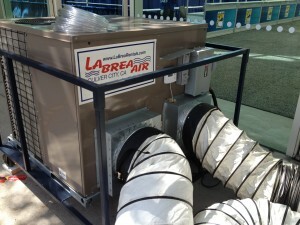 Medium or 5 – 15 ton packaged air conditioning rentals come either on a skid or roll able cart on wheels and on trailers. 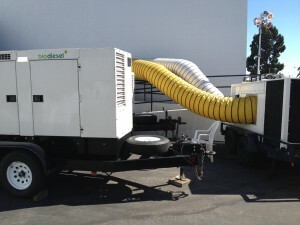 A 5 ton portable cooling unit can cool typically up to 2,000 square feet. 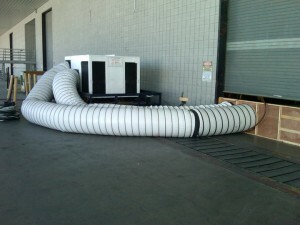 These units are used extensively for cooling event tents, movie sets, stages and auditoriums and supplemental or temporary replacement cooling during repairs. The advantage of these units are, they won’t take up space inside your conditioned space and since they are located outside your space they are inherently quieter. Power requirements are 208 volts or 230 volts, 60 cycle, in either and or (1) single phase power or three (3) phase which is normally found in commercial and industrial locations. A 50 ft power cord is included with the packaged cooling unit along with two (2) – 25 foot long flexible ducts and a condensate drain hose for the condensate water is collected in an internal drain pan. Other accessories include remote thermostats and remote start/stop switch. These units are also available with auxiliary electric heat strip to provide heat when it is cold. If electrical power is not available at your location we can also provide a portable mobile rental diesel fueled generator to power the rental chiller. Your friendly sales-engineer can help you select the best combination of Packaged Air Conditioning unit and generator for a turn-key rental experience. We would be happy to come out to your location to assess your location for the Best Rental Choice and setup and provide you with a rental quote, just call La Brea AC Rentals anytime.